Local MMA personality Ray Flores has been named the cage announcer for the upcoming Shine Lightweight Grand Prix, which takes place at The Patriot Center in Fairfax, Virginia on September 10th. 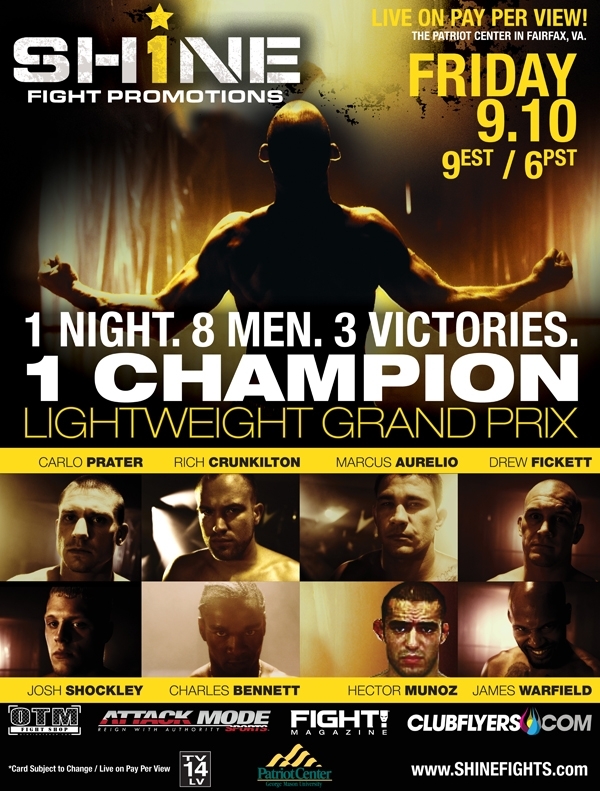 The tournament format is having success in Bellator and now Strikeforce. Shine’s lightweight Grand Prix looks like it will continue that excitement. It’s an especially great opportunity for Duneland Vale Tudo’s Josh Shockley. He was supposed to fight Mark Miller at Bellator 25, but Miller had to withdraw due to an injury. A killer knockout or sub could make Shockley or any of the other combatants a “You Tube Hero” a la Toby Imada’s inverted triangle. It could be a great career boost. You can watch the tourney on Friday, September 10th at 8pm Central on pay per view. A promoter, (dba “Shine Fight Promotions LLC), had scheduled a pay per view event in our state on May 15, 2010. The event was cancelled a couple hours before the main event was scheduled to air. We cancelled the event due to the fighter’s safety and well being. There was no doctor on-site along with the fighters purses were not available two hours before the start time of the event. We attempted to work out the pay issues for two fighters along with the losses of the Boxing Authority. After several failed attempts to resolve the issue with the promoter and his legal team, we contacted the bond’s company on June 17, 2010 and submitted a claim against the bond. On August 17, 2010, we received a check from the promoter for all the officials that worked the event until it was cancelled; however, this check did not provide the fighters any financial relief. After meeting with our legal staff, we released the claim on the bond for the promoter on August 23, 2010. This release of the bond would allow the promoter to seek out other states to hold an event; therefore, we have placed Devin Price dba “Shine Fight Promotions LLC” on Fight Fax, Red Flag list. North Carolina Boxing Authority doesn’t have an issue with any other state wishing to allow this promoter or his company to conduct business in their state; however, they’re welcome and encouraged to contact me personally regarding the full details of Shine Fights case file. Really has nothing to do with the next event. I would be shocked if this one does not take place.